(I was pretty sure that he knows Galliano for his abrasive and uncontrolled language which, soaked in alcohol, resulted in winning the infamous award-for-anti-Semitic-remarks of 2011 (Anti-Defamation League welcomed his "recovery and redemption" - n.p. if I feel like reading a UN resolution it is because the issue was dead serious), than for his perfect dresses and fashion genius. Of course I know who Galliano is! I even know who his personal trainer is! - and this is a first. Usually, I only know stars, names, and faces, after years and years of Oscar nominations. I am that slow with what's ripe and hype. But this is what I get for putting him through the misery of looking at two Harper's Bazaar (European edition) & Vogue (US) for an entire afternoon. His commentary was refreshing and intuitive. 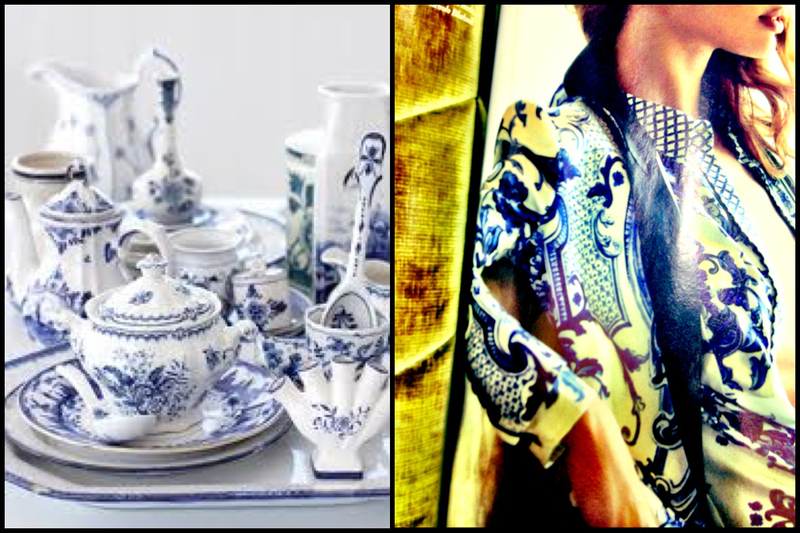 "This [Cavalli Pre-Spring 2013 - amazing, perfectly tailored jacket - pic#2] reminds me of ceramic tea cups", and he texts me photo #1 immediately after. What do you know? this IS a porcelain inspired collection to its max, where everything: the metallic accents, the glossy texture, are thought to resemble the delicacy of little cups, with two other, paradoxical only when done poorly, ramifications: freedom of pursuing luxury and strictness of elegance. 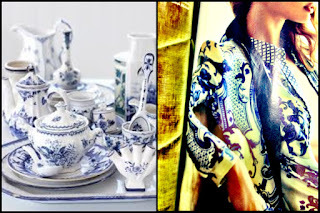 "I don't like color blocking"
Photo#1 Porcelain; Photo#2 Cavalli add. Challenge: count how many times I wrote "Galliano"